We woke up at about 7 in the morning. 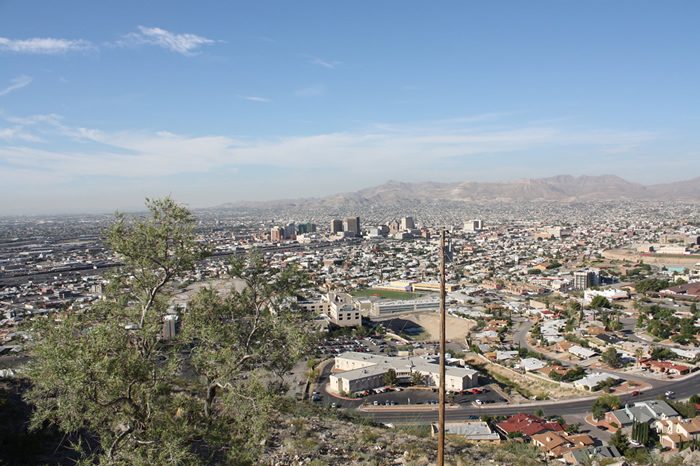 Since El Paso isn't exactly a large city, we decided to just quickly drive around a few places and be on our way since we had a very long drive. We ate a quick continental breakfast at the motel (and Vlad had a quick online session) and we were on our way. At first we went to this scenic drive that basically overlooks the whole city. 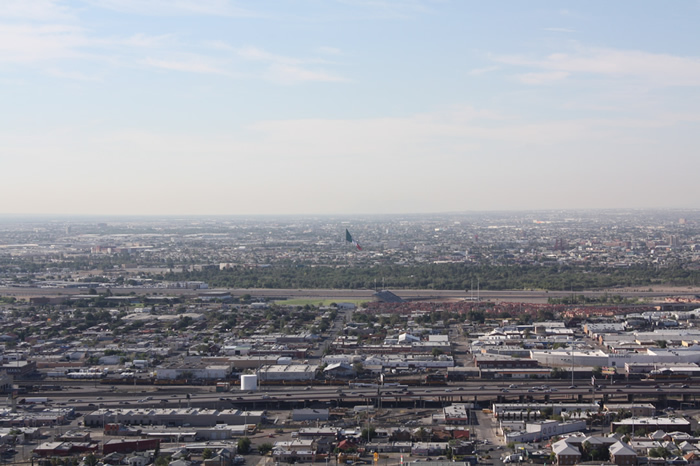 We had fantastic views of not only El Paso but also Juares, Mexico. There was a ginormous Mexican flag waving at the distance. The weird thing is that there was no US flag that we saw that could even start to compete with that. We also saw a huge line of cars crossing a bridge from Mexico that were trying to get in. Supposedly, according to the waitress last night, there is also a line now to get in to Mexico. We didn't really see that as the cars were moving freely in the other direction. That could be the case for El Paso though as the number of people traveling between the two cities to work and live is a lot greater than those that cross the border in San Diego. After a short photo session fiasco, we went on to a place with a few museums. 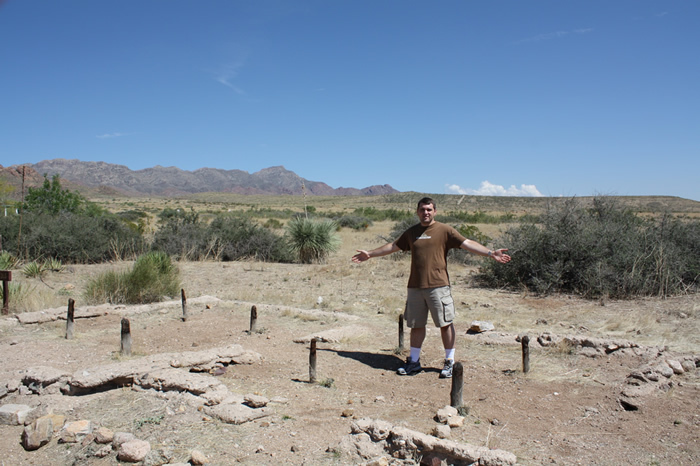 The first one was an archeology museum located on the outskirts of El Paso. Outside the museum, there was a cactus garden that we slightly explored as we were waiting for the museum to open. We were just a few minutes too early. 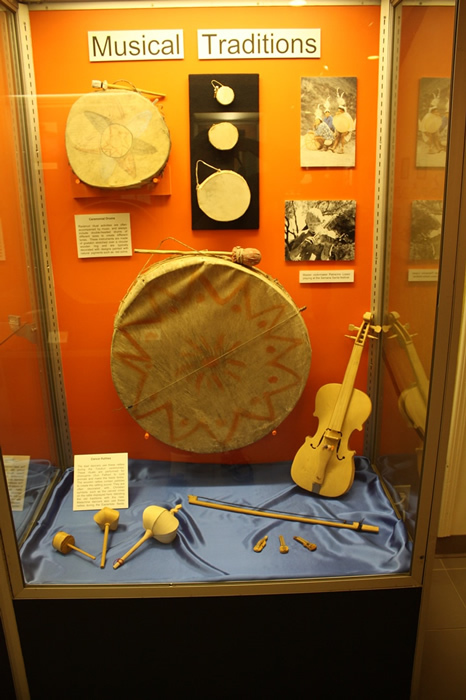 The museum offered displays and monuments from the Native Americans dating as far back as about 4000 years ago. 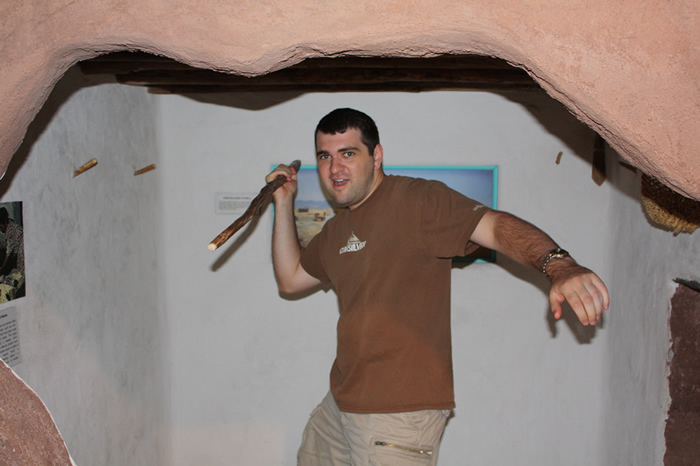 As Native American culture greatly interests me, I found that museum very informative and entertaining. Unfortunately, we were not allowed to use the flash inside so a lot of the pictures were not coming out too greatly. I did put out the best pictures that we were able to take. The museum was divided into two parts. 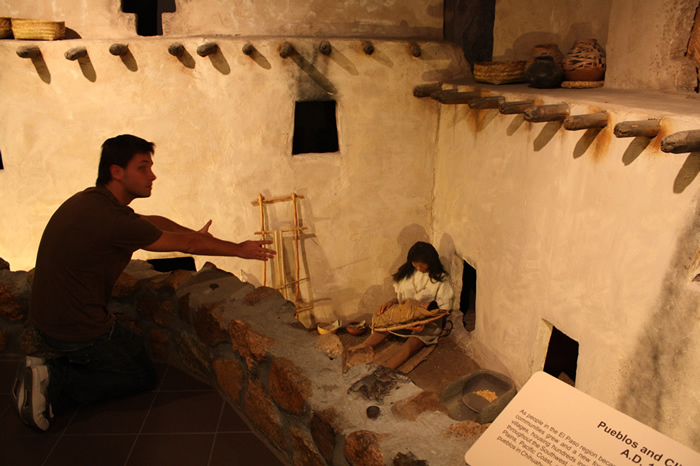 One part was an area with models of how people lived and did as the picture above shows one of the scenarios. The other part was mainly filled with artifacts that were collected over the years. In the entrance area, there was a small gift shop and a kids type of play area where you could actually touch things and use the flash. 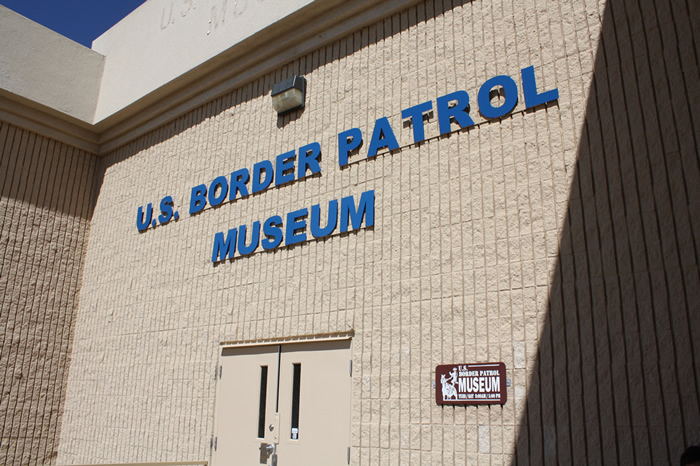 We then went on to a museum next door called the border patrol museum. 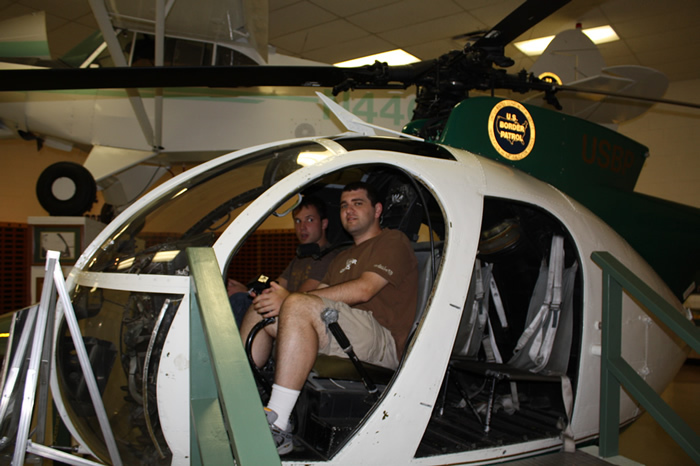 It had some cool stuff in there including cars, rtv's, boats, and there was even an old helicopter. Most of those vehicles we were allowed to get in and play around with. There was also a wall honoring those that died on duty dating as far back as the 1920s. And then there were uniforms, badges, weapons that were both used by the border patrol and smugglers (including one mean looking machine gun). 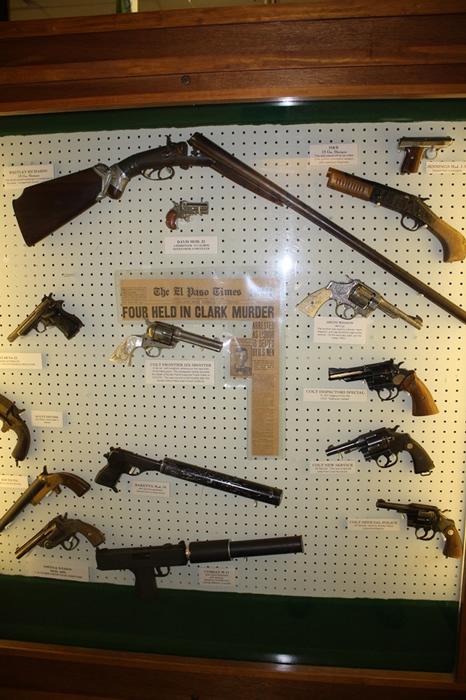 Both museums were fairly small, but they were free and so our El Paso experience came out pretty cheap. We did a short 1 mile hike next to the Archeology museum on something called a nature trail. 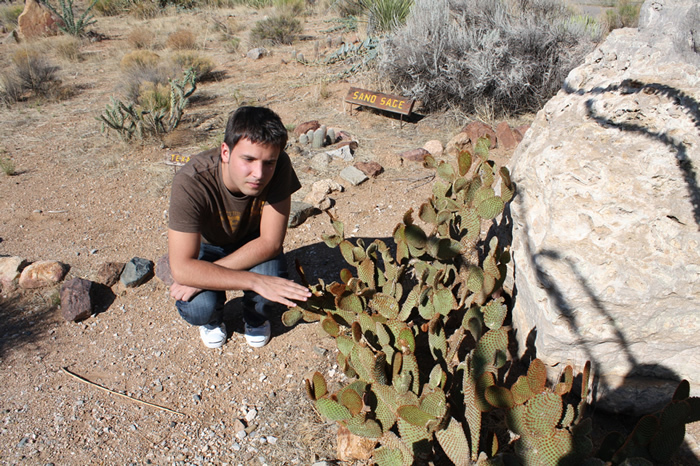 There were cactuses and some Native American monuments along the way. Those included tipis, huts, and old stones and woods from an ancient Native American house. Following, we were on our way to San Antonio, TX. About an hour drive from El Paso, we stumbled on to a border patrol checkpoint. Seeing 2 white people in the car, they waved us on, but we did see a few cars there that were completely getting searched. Following that however, we saw a sign that said that there was some historic town. We decided to check it out. The town was old, run down, and very creepy. Most of the building were abandoned and broken down to just an outer shell. We saw a dog that was just running down the middle of an empty street. We didn't stay there for too long and were back on the freeway. The next few hours were pretty uneventful as all we did was just drive, however at some point we got hungry and the only thing that we found was an exit with a gas station, a convenience store and a bar right next to it. It wasn't a bar/restaurant type of thing, it was just a bar. There was a little dining place inside where you could buy some food, but it was closed. We were pretty hungry at that time so we bought a few snacks. I thought I still had plenty of fuel so I didn't buy any gas. We drove for a little while and then I noticed that my gas light came on. It has been about 10 miles since I've seen the last gas station, so I thought, no problem, there will be one soon. 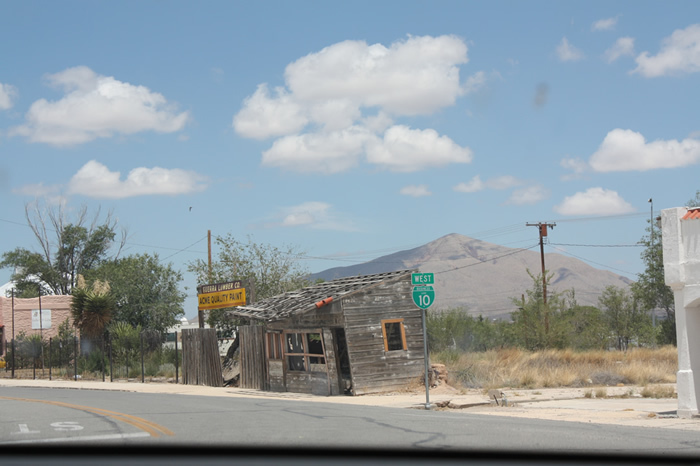 However, as we drove on, I started getting more and more worried that there might not be one in time and that we could get stranded out there with no gas. Our GPS wasn't showing any near gas stations either. The next relatively big town was about 70 miles away (since my light came on). Panicking, I reduced my speed to a range of 50 to 55 (the speed limit there was 80) and prayed for a miracle. 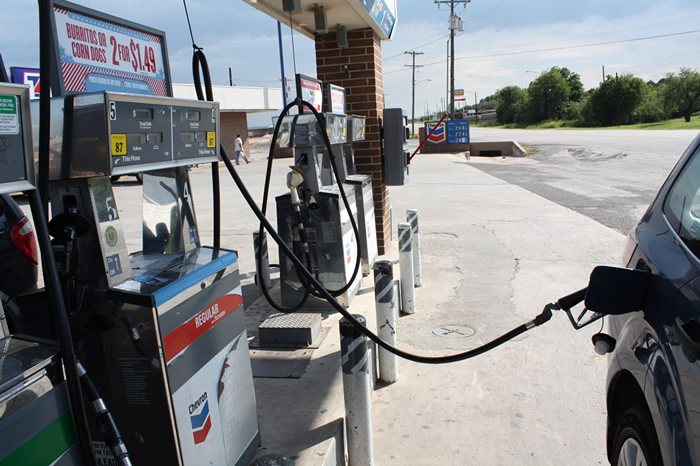 As far as I remember, I thought I remembered reading that there should be about 2 gallons of gas in the car after the light comes on. That should give me about 40 to 50 miles. And somewhere down the road, about 50 miles after the light came on, we saw a top of a gas station. We breathed a sign of relief that is until we drove up to it. The place was abandoned and boarded up. At that point all hope was lost as the next town was still about 20 miles away and my needle was laying flat on the bottom. But we had no choice and continued our drive. At that point, I even started using neutral when we were going downhill. Cars and even all the trucks were trying to go around, no doubt asking why the hell I was going so slow. We even drove through a “parking area” to see if there was anyone we could ask if they have extra gas that they could sell. At that point I was willing to pay $7 for a gallon. Maybe more. But alas, there was only one big truck in that lot, and I'm pretty sure my car wouldn't run well on diesel. After another 20 minutes of praying, we miraculously did arrive at that town, and as we drove in to the gas station, I've never been so relieved. I pumped about 16.3 gallons in to my car and I thought that my tank could only hold 15. 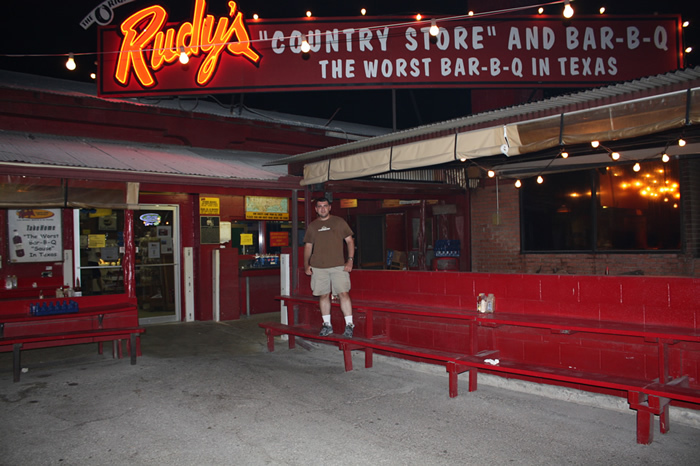 As we continued, towards the end, we got hungry, so about 40 minutes from San Antonio, we stopped at this place that claimed they had the worst BBQ in Texas. It was a very interesting place. You pretty much walk by the counter and say what you want. First you grab things like corn chowder (which was delicious I might add), beans, potatoes, etc. Then the lady behind the cutting table in the back screams what I want. The selection was rather small, it was things like beef, turkey, sausage, beef ribs, baby back ribs, and some thing else I'm not quite sure. They also had this long crate filled with drinks and beer. Almost all the beers were Budweiser beers of different sorts. They serve it all to you in a Pepsi crate. 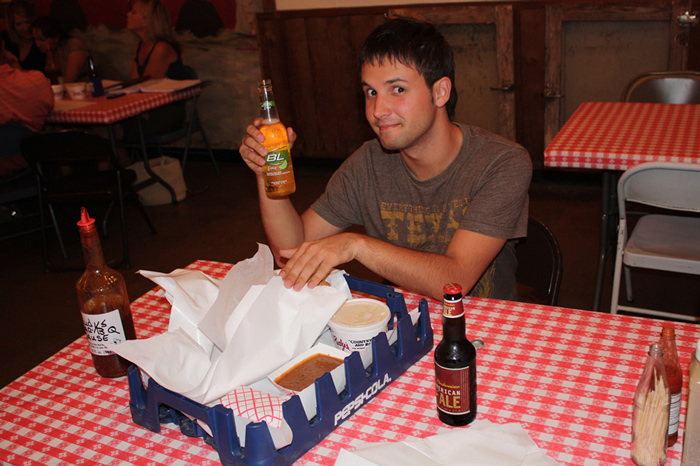 Then you take that crate and go and sit at one of the long wooden tables inside or out. It was pretty humid outside, so we sat in. The food was very good and the place was pretty unique. We ate, took pictures, signed their guest book and were once again on our way. 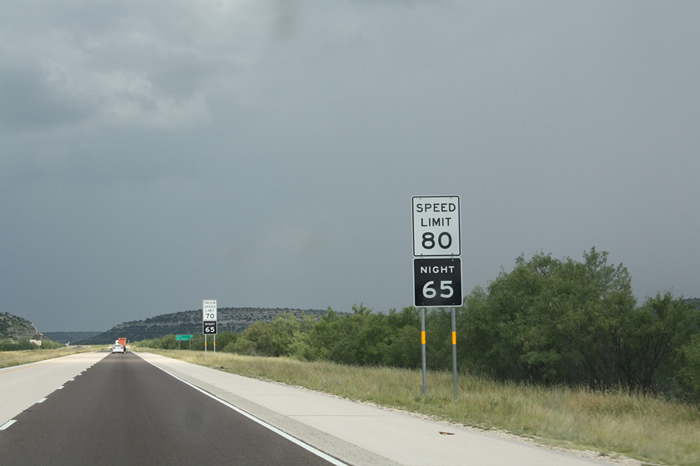 An interesting observation that I made was that during the day, as we drove through texas, the speed limit signs showed speed limit during the day and during the night. However, as we drove from the restaurant (in the dark), we passed another one of those signs however this one only showed the part in black, for the night speed limit. And it's not like the top part is just not visible in the dark, it wasn't there at all. We could not figure out how that could be possible. It was as if there are workers that drive by every morning and every night and take off and put on the top sign. We only saw one of those before entering San Antonio (where the speed limit changes) and so we could not double confirm (and photograph) our finding. We had decided to spend 2 nights in San Antonio cause it was pretty late already and we wouldn't see the city tonight. So we just found the cheapest motel that we could farther away from the city. It was Motel 6 and honestly, after staying there for one night, I would have rather paid an extra 20 bucks to stay at something better. Our "non-smoking" room smelled like smoke. There was even an ashtray provided. There was a cigarette burn in one of the bed covers. The room was extremely small, with only 2 beds and a little walkway between them. There was no soap or shampoo in the shower. The shower itself was just a standup shower and it leaked water all over the place. In addition, there was this party in the other room where they had this mini BBQ thing all lighted up. What's worse, is that it was a bunch of skinny white boys, and these elephenmangus black woman. I crumbled in fear just glancing at them. In addition, we bought a wireless internet card, but after trying it on the iphone, we realized that it only works for one computer and I couldn't connect to the internet on my laptop. The desk guy's words were “Well, it's always been like that” after I went to complain. Let me mention that it says nowhere on the card nor on the ad in the office that it's only one computer. How the hell am I supposed to know how it's always been. I had to call the number on the card so that they could connect me and it took a while cause the person on the other end had no “guide” on how to deal with people with Linux. That little fiasco took about an hour of my time. After a little while we went to sleep.